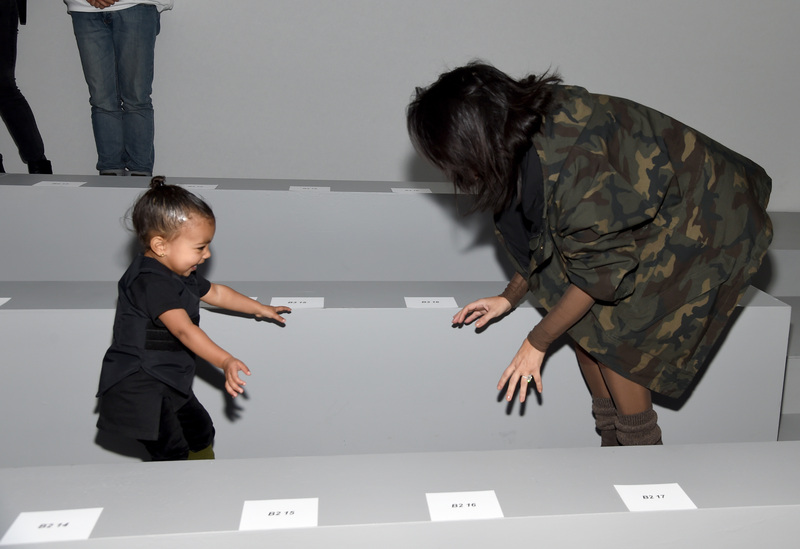 Kicking off New York Fashion Week with a bang, Kanye West dropped Yeezy Season 3 on Feb. 11 — and of course Kim Kardashian and North West were there to support him looking as fabulous as ever. Donning matching fluffy white jackets, they looked like a couple of angelic snow queens, especially compared to the serious, militaristic looks featured in the Yeezy presentation. Oh, and did I mention Kim's blonde again? Like, real blonde. I guess this is her MO for all her husband's fashion endeavors. Of course, the rest of the Kardashian-Jenner fam were perfectly coordinated as well, though, much to my dismay, not all wearing the exact same coat as Kim and North... though Kourtney's is pretty darn close. Although Kanye's third season shied away from neutrals compared to his last, the family theme still seems to be black and white. And I'm assuming that North was in charge of picking everyone's outfits, since that whole fluffy coat thing is apparently one of her favorite pieces. Underneath the coats, North rocks a very comfortable looking hoodie while Kim... well, the photos we have so far don't show much underneath, but I think it's safe to say it's not a sweatshirt.